Asado is a well known dish in Pampanga. This was our Lola's specialty from Tarlac - she would cook for us whenever she visited Manila way back in the 80’s. Later on, it became one of our mom's special occasions' dish. Now that mom lives in the US, I tried to re-create the dish for my family. Our lola's Asado Kapampangan is a pork or a chicken dish which is boiled in soy sauce and calamansi and is sautéed in onion, garlic, mashed tomatoes. Tomato paste is then added to give that wonderful color of the dish. The chunk of pork is boiled whole for 1 1/2 hours before cutting it thinly so that the outer portion is salty and tart while the inside is mildly flavored. The thickened sauce is then topped on the meat when served. 1. Fry the potatoes until medium golden brown, set aside. 2. 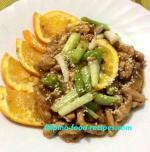 Mix pork, calamansi, soy sauce, pepper and water and boil for 1 to 1 1/2 hours or until tender. 3. In a separate pan, saute the garlic, onion, tomatoes, then add the tomato paste. 4. Add the pork and 2 cups of the liquid from boiled pork. 5. Bring to a boil until the sauce thickens, basting the meat with the sauce. 6. Add the butter, and remove the meat from the pan. 7. Slice the meat thinly and serve on a platter. 8. 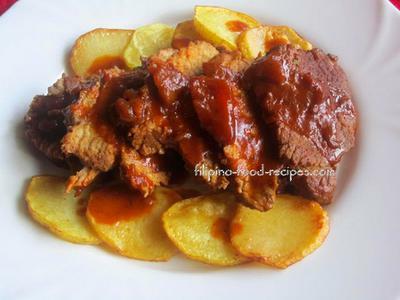 Top with the sauce and serve with fried potatoes.